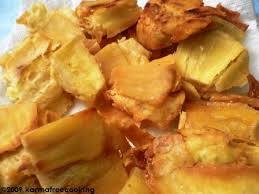 Tostones de Platano - Tienditadepuertorico.com - Buy Puertorican Food Here!! Work quickly but very carefully. otherwise wait a couple of seconds more and try again. with no browning. This should take about 2 or 3 minutes. Remove from oil and drain on plate lined with paper towels. Repeat until all slices are cooked. Do not turn off heat of frying pan when finished. flatten them on my cooking board until it is about 1/4 inch thick. both sides, turning once. Remove from pan. Drain on a plate lined with fresh paper towels.